Private Chain is important for data privacy, permission control, as well as testing dApps and smart contracts. A private chain is an isolated copy of public blockchain which would run on your local machine. In this article, we’ll be going through the basic steps to run NEO private chain on a local machine and receive some initial NEO and GAS tokens. To set up the NEO private network (often called private-net), we have to install and configure Docker in the local system. If you’re using Windows 10 Pro, you can download Docker directly. For an older version of Windows, you need to install and configure the Docker toolbox. This will display the version of Docker that has been installed in your system. Pull the latest image using the following command. Kindly note that the size of the image is a bit larger. So, it’ll take some time to download it. Once the image is pulled up, start the container using the command mentioned below. To check if the container is running or not, fire this command which will display the current running container(s). Download the NEO-GUI wallet from here or use developer version (recommended for development) from here. Replace the content of the config.json file and protocol.json file with the following network details. Run the neo-gui.exe installation package and check the connection between NEO GUI and the docker container. If you can see the number of connected nodes is 4, that simply means that the connection has been established successfully and the numbers represent the consensus nodes. Create a new wallet from NEO GUI Tool, go to wallet > New wallet database > input wallet name and password, it will generate a new wallet file for you. Click OK, and check NEO and GAS balance you have!! We can use this NEO and GAS for smart contract execution. 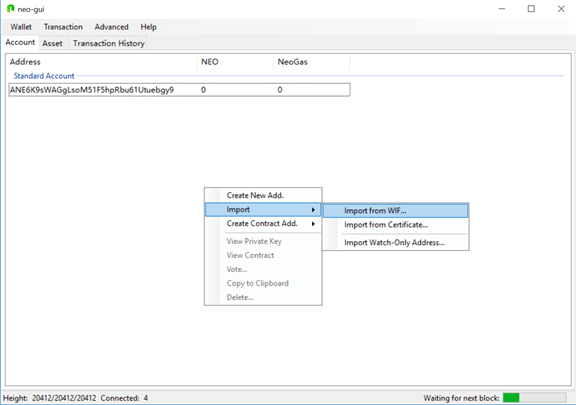 In this article, we’ve have seen how to setup NEO private network and got some initial NEO and GAS tokens. These we can use in testing smart contract over a local system. There are several other ways to configure it, however, the easiest one is using Docker.